How Much Do Blueprints Cost? Sometimes ESPA receives calls asking how much blueprints cost. Often those individuals think that architects generate drawings and that is how we make our living. However architects bring much more value to a project. It is up to architects to educate potential clients so that we can be a positive resource for them as we lead them to the solution to their design challenges. 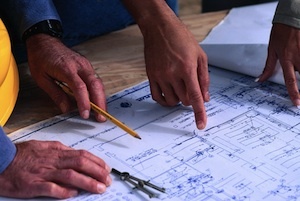 The most prevalent question is how much does it cost to use an architect? To put this in perspective a comparable question is how much does a car cost? Well, what are the priorities for selecting a car? Image, safety, comfort, cost to operate? Similar questions apply for architectural services. Architects assist with feasibility studies, building and site evaluations, coordination with reviewing agencies, programming for clients, site selection, evaluation of sustainable issues, accessibility, building code issues, demographic studies . . . Oh, and architects design buildings too. In answer to how much do blueprints cost, the first question that ESPA asks is for more information about the purpose of the blueprints. Each answer will lead to another question until ESPA, and any other architectural individual or group, has a grasp of the potential project. How much do blueprints cost? Well, what kind of car do you want?